BlueDOT ASCA IgG+IgA is an Immunodot kit intended for the detection in human sera of IgG/IgA autoantibodies against Saccharomyces cerevisiae (mannan) antigen. Each kit contains 24 tests. BlueDot kits are composed of 24 nitrocellulose strips on which the antigens have been coated in a dot-shaped format. 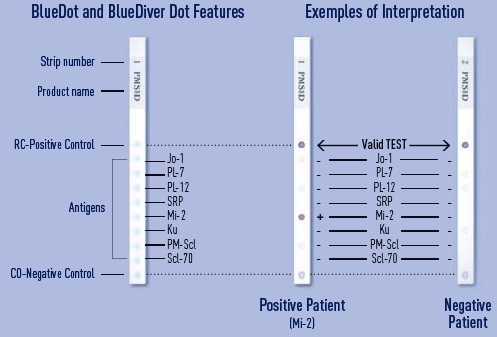 One strip allows the testing of one patient for many different autoantibodies in the same run. The test is based on a classical Enzyme ImmunoAssays (EIA). The results can be interpretated by sight or a semi-quantification can be obtained thanks to the Dr DOT software.